There's some guy on the phone for you; he didn't give his name. Maria went out for drinks with the guys from her evening class. The newspapers guyed the politician over his mistake. The crew used a guy to steady the cargo as they lowered it on the hoist. The ship was secured with guys. The sailors guyed the booms. 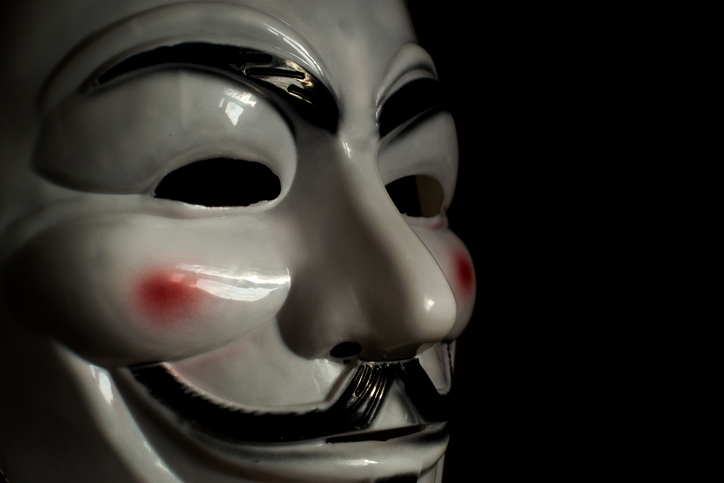 More recently, as a result of the novel and movie, the masks have come to be used by the online hactivist group Anonymous and by the anti-establishment Occupy movement. You’ve now read all about Guy Fawkes, but did you know, the word guy, most commonly used to mean ‘person,’ originally comes from this bit of history? Guy began to be used in the UK in the early 19th century to refer to the effigies that were burnt on November 5th. That evolved into UK slang meaning ‘poorly dressed person’ or ‘grotesque person’ in the 1830s. By the time it reached the US in the mid-19th century, it had expanded to simply mean ‘fellow.’ The unrelated noun, meaning ‘rope, chain or wire,’ dates back to the early 14th century. The Middle English gye, which originally meant leader, came into English from the Old French guie (‘a guide,’ as well as ‘a crane or derrick’), from the verb guier (to guide). It originated from a Germanic word, probably the Frankish witan (to show the way) or a similar source, from the Proto-Germanic witanan (to look after or guard,’ as well as ‘to ascribe to’ and ‘to reproach’), and the Proto-Indo-European root weid- (to see). It is related to the German weisen (to show or point out) and the Old English witan (to reproach) and wite (fine or penalty), as well as many English words such as advice, Druid, envy, evident, history, idea, idol, improvisation, interview, provide, supervise, visa and even penguin. The meaning we use today, ‘a rope or chain,’ dates back to the early 17th century. Finally, the proper name Guy came into English from the French Guy, but is related to the Italian name Guido.